HangglideOz will email your booking confirmation within 24-48 hours. For any last minute bookings (under 24 hours) please complete the booking form and advise us via text message on 0417 939 200. 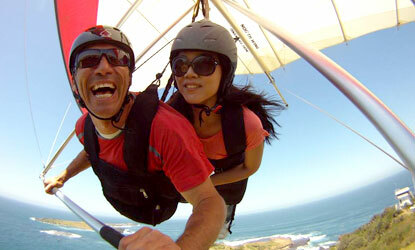 Join us for your weekend 30 minute tandem hang gliding flight from Bald Hill, Stanwell Park or Hill 60. Flights can be taken any weekend or public holiday. Weekend prices reduced from $295 and include free inflight photos ($45). A total saving of $65! 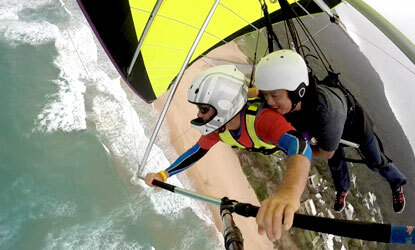 Join us for your mid week 30 minute tandem hang gliding flight from Bald Hill, Stanwell Park or Hill 60. Flights can be taken from Monday through to Friday (excluding public holidays). Flights include free inflight photos ($45). A total saving of $45! Our professional videos use 3 HD cameras of the flight to capture all the very best of your hang gliding experience. Our videos are uploaded to Vimeo/Youtube in HD for easy viewing and sharing on social media. Please ensure you bring your voucher with you on the day of your hang gliding flight. * Children need to be a minimum of 12 years of age to hang glide and must be accompanied by a parent or guardian. * We will endeavour to book your hang gliding flight as close to your preferred time of day. We do recommend people have flexibility on the day, as hang gliding is weather dependent. If you are travelling by train, we will arrange to pick you up and return you to the station at the end end of your hang gliding experience.